Spanning 75 Countries, each with a National AOPA, we form International AOPA (IAOPA), which is the largest and most influential aviation community in the World, representing all of General Aviation from the International Civil Aviation Organisation (ICAO) to the field you fly from. No other General Aviation organisation can match that! Our primary function is to lobby on behalf of GA wherever there is a threat to your freedom to fly at the lowest cost, with the most proportionate regulation, with access to as much airspace as possible and to a network of Airfields with GA access. AOPA have the most complete network of contacts where it matters. 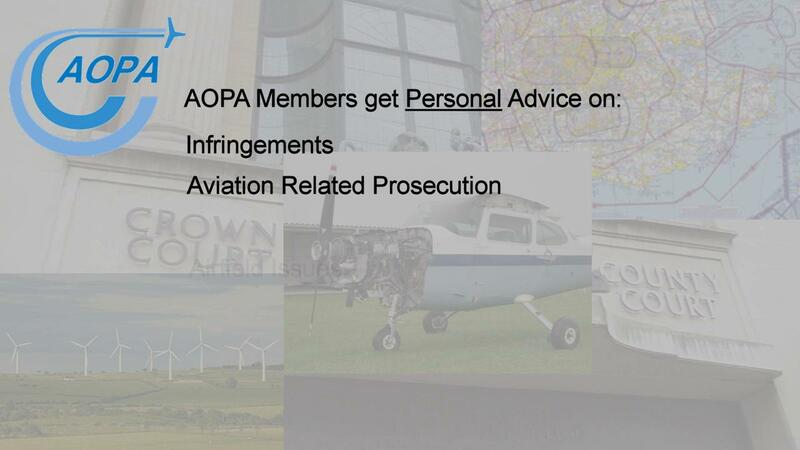 Welcome to AOPA UK - Join and become part of the Community and share the cost of protecting your flying interests. Read on if you would like to know more. The origins of AOPA UK go back to 1928 when the 'Council of Light Aeroplane Clubs' was formed as a subsidiary of The Royal Aero Club. The Royal Aero Club also had extensive air racing and social interests as well as general flying interests. The Council split from the Royal Aero Club after the Second World War and became independent as the 'Association of British Aero Clubs and Centres'. In 1966 the 'Association of British Aero Clubs and Centres' merged with the 'Aviation Centre of the Royal Aero Club', which had by now also separated off from the Royal Aero Club, to form the 'British Light Aviation Centre', BLAC Ltd, as a company limited by guarantee and not for profit. As a totally independent non-profit organisation, supporting General Aviation (GA), BLAC Ltd were invited to join the International Aircraft Owners and Pilots Association (IAOPA) and trade as AOPA UK. Thus AOPA UK, the trading name of BLAC Ltd, was born. AOPA UK is recognised by the UK Government and the CAA, along with many other bodies, as a representative organisation for GA. Equally, as part of IAOPA our voice is heard at the International Civil Aviation Organisation (ICAO), which generates resolutions and policies, the source of subsequent regulation affecting your interests in GA.
IAOPA has established regional IAOPA's. In the case of AOPA UK we are also part of IAOPA Europe. Through IAOPA Europe, we have access to the European Aviation Safety Agency (EASA), where the ICAO rules are converted to regulation, EU Commission and EU Parliament regardless of whether the UK is a member of the EU or even EASA. Therefore, as a member of AOPA UK you voice is heard at all relevant levels, without any influence from any outside source. It is an absolute requirement that, to be able to use the AOPA name, AOPA UK must be totally independent from any external influence, other than the views of our members. You can read more about IAOPA Polices and Positions and how IAOPA works - HERE. Much of our success is achieved without fanfare, as a result of building a network of well placed contacts who can be approached personally on an informal basis, to discuss views and ideas. Of course, much is achieved in working groups and committees as part of the formal process of consultation in the UK, Europe and ICAO. How does this work benefit you? We were instrumental in the development and introduction of the UK National Private Pilots Licence (NPPL). We were the first to campaign for a poor weather rating, which resulted in the IMC Rating (much opposed at first by other organisations). We continue fighting to allow this rating to continue. We were successful in having AVGAS treated as a special fuel, with a much reduced duty rate saving you money on every hour you fly. We persuaded EASA not to introduce VFR Navigation charges for aircraft up to 2000 Kg. This concession is saving you around £20 per hour. We continue fighting to retain it. We were fully involved in the campaign to have the Part-M Aircraft Maintenance regulation reviewed by EASA and replace it with a lighter regime for private aircraft. We are fully involved in the revision of PPL training at EASA. We have been campaigning for a basic Instrument Rating for Private Pilots, which is now bearing results. We have provided personal assistance to hundreds of pilots who have fallen foul of the CAA (and some who have fallen foul of European Regulators), saving many a court appearance. We have successfully campaigned for an appropriate response to regulatory offences, including infringements, not automatic prosecution. We have influenced the revision of Flight Training facility regulations at EASA, giving Student Pilots a wider choice of where to learn to fly. No-one else achieves more, and continues, to help you keep flying and protect your investment in GA.
No-one else has the reach of AOPA together with IAOPA, whatever they claim. AOPA Invites GA Related businesses and services to join AOPA as a Corporate Member. Being a Corporate Member of AOPA means that you can directly influence our position on Regulation facing your business. You will have access to our wide range of expertise in the field of GA, with personal advice and support if needed. You can be involved with our work through our Corporate Members Committee or Maintainers Working Group. You may also have a contact page on our website to promote your business with visitors to our site.